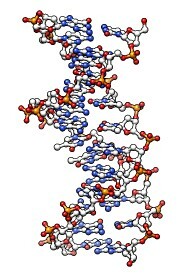 No microscope is powerful enough to see the DNA helix, so we look at models. 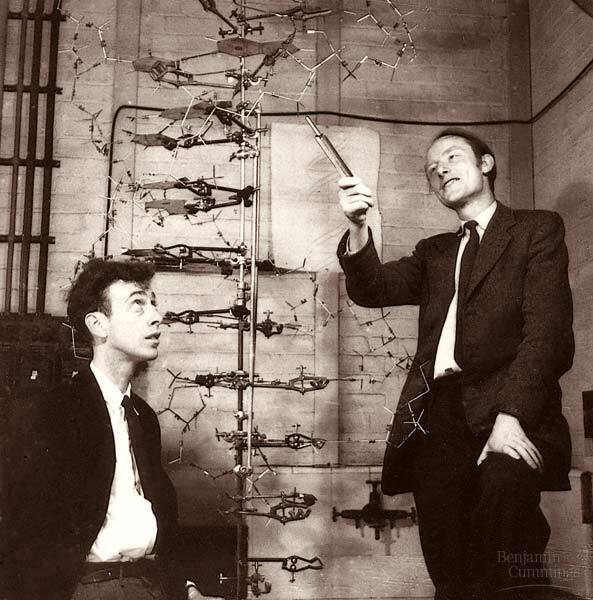 Watson & Crick model made from metal rods, 1953. 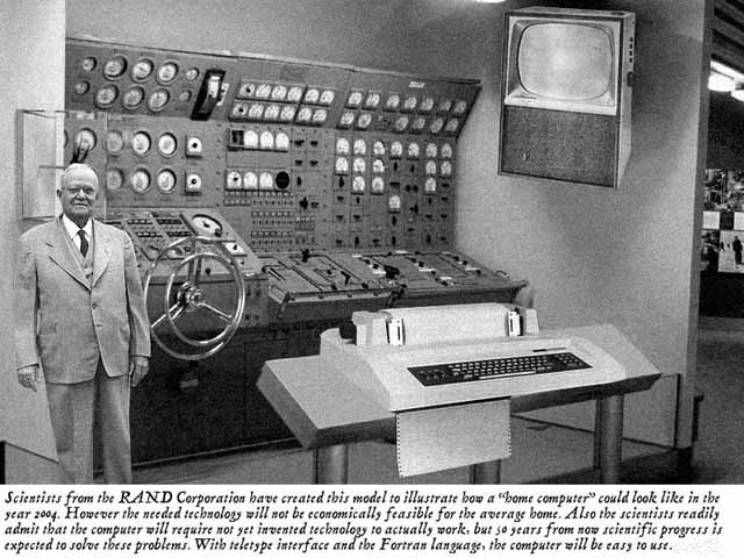 A dream "home" computer imagined in 1950 when DNA structure solved. Molecular visualization was 20 years in the future. 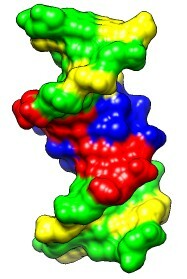 Today molecule models are usually viewed on computers. 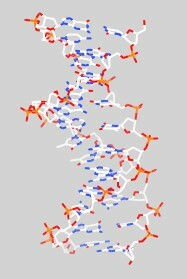 Small double-stranded DNA in Chimera, 1BNA. Representations: slabs, sphere, ball and stick, stick, wire, surface. 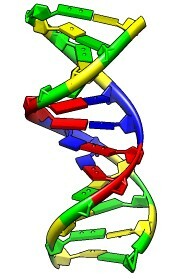 Standard atom colors: white carbon, blue nitrogen, red oxygen, orange phosphorous. Which one does it really look like? Sphere style is maybe most realistic. Fly down axis (ctrl-middle button drag). 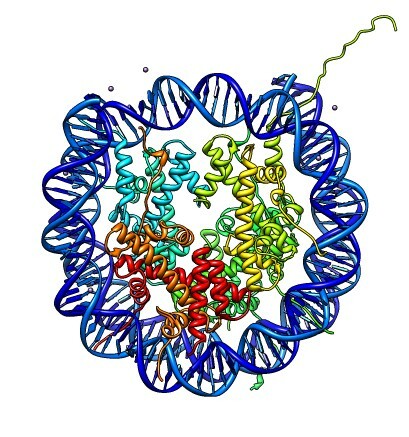 DNA in cells is wrapped around a spool (PDB 1AOI) called a nucleosome. Just 2 turns are wrapped on each spool. Millions of spools are in each chromosome. 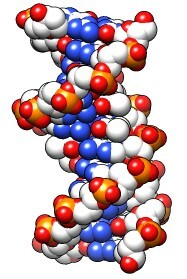 DNA spools are stacked to make filaments. Session file 1zbb-chromatin.py, 100 nucleosomes. 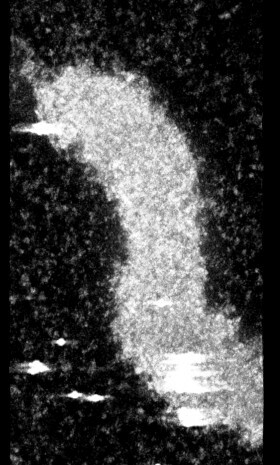 Electron microscopy -- fly chromosome tomography. Dividing cells seen with light microscopy. show time series, stereo glasses. Fly (drosophila) has 4 pairs of chromosomes, but one pair is too small to see. Reduce z size to 0.15 um for better appearance. 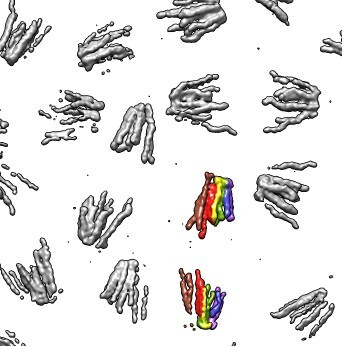 arms.cmm colors chromosomes of one cell, color range 1, z grid 0.15 um. use "cache 30 renderings" to improve speed. Show virus paper strip RNA, explain human DNA paper strip would fill entire room tightly packed.